Time for another post so I thought I’d go back to the particle physics. Wow there’s a lot of subatomic particles. The more I stir this quantum soup, the more I need to get to grips with my mesons, baryons, quarks, antineutrinos and lambda particles. Not forgetting, of course, the gluons, photons and bosons! Ok …. so lets start explaining what’s what. I want to keep it really simple for now, so it’s as accessible as possible. Most particles already get grouped together to form families, so I’m thinking some sort of list or glossary might be in order! Evidence of neutrino interactions in a bubble chamber. A beginners guide to the Leptons. Leptons are fundamental particles. By fundamental, we mean that they are composed of nothing smaller (by current thinking). They are divided into two main groups: the charged leptons (ie electrons) and the neutral leptons (ie. neutrinos). These leptons are further classified into six distinct types, also known as flavours, occurring in what is known as three generations. Lots of sub atomic particles have favours and generations as we’ll see in subsequent posts but lets not worry about this now. In the first generation is the electron (e–) and the electron neutrino (Ve). In the second generation are muon (μ−) and the muon neutrino (Vμ). This last lepton, the tau neutrino, was only discovered eleven years ago in 2000 at Fermilab in the US and indicates just how recently new discoveries are being made in the field of particle physics. Each of these six fundamental particles also has a corresponding anti particle. Its exact opposite, if you like. An example of this would be an electron (e–) and the corresponding antiparticle, an anti-electron , often called a positron (e+). They differ from each other only in that some of their properties have equal magnitude but opposite sign. All leptons have some intrinsic properties like mass, charge and spin (that’s quantum spin by the way). Unlike hadrons, they are not affected by the strong interaction, only by weak interaction, electromagnetism (except neutrinos which are electrically neutral) and gravitation. Ok … so now we know what they are and how we classify them but ….. what exactly do they do and where can we find some ?? However that’s not really the case. 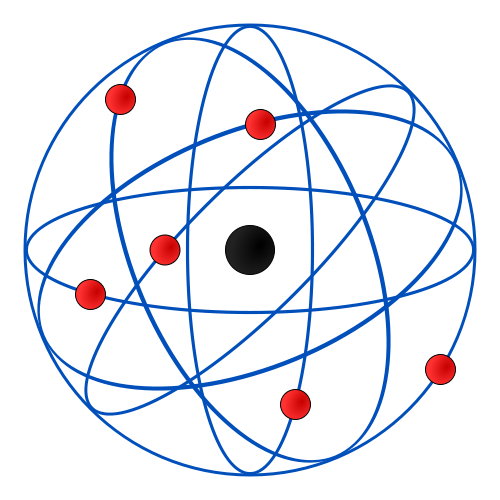 We need to really think more along the line of an electron cloud – a little like an electron probability map. This diagram (left) shows what I mean.  The purple spot in the centre representing the nucleus and the haze around the outside representing the probability of finding an electron in that location. The darker the haze the greater the chance that an electron could be found there. Its all to do with quantum mechanics and a gentleman called Heisenberg. He came up with a principle – the aptly named Heisenberg Uncertainty Principle – that stated that you could not know a particles exact speed and position with 100% certainty. This is better stated as – the more precisely one of these qualities is known, the less precisely the other one can be determined. But, again… I digress, so …. back to the leptons then. Electrons (wherever they are!) control most of the chemical properties of the elements and govern how elements react with each other. They are very light weight, having a very small mass and are very stable. Muons are heavier, with taus being the real heavyweights. Both muons and taus are very very unstable and short lived with lifespans ranging from 2.1×10-6 in the case of muons, to 2.9×10−13 for taus. Both muons and taus can only be created by high energy collisions such as those created by cosmic rays or in particle accelerators. Both particles break down readily, via particle decay, explaining their short lifespans. Muons decay into electrons and various neutrinos. Taus however, are much more complicated and are the only leptons that can decay to various hadrons as well as other leptons.